Several mummies complete with sarcophagi were retrieved from dirty water where they’d been found floating near El Minya, Egypt. According to a statement from the Egyptian Ministry of Antiquities, two previously unknown Greco-Roman era mummies were located this week. They had been buried in tombs in a small village in northeastern Egypt, 240 kilometers (150 miles) south of Cairo. However, police were alerted to the sarcophagi when they were spotted floating in polluted sewage water. 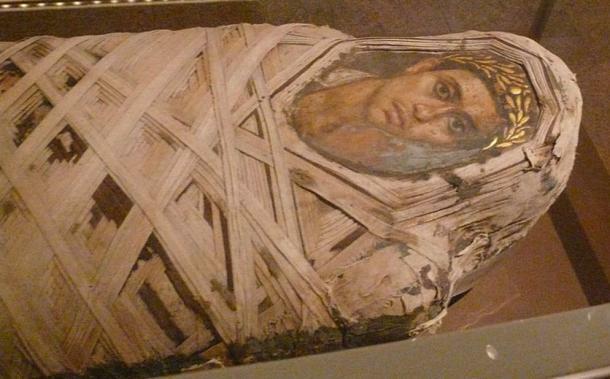 The centuries-old sarcophagi held mummies which were wrapped in many layers of thick linen. Very few human remains were recovered from the wrappings. The wooden sarcophagi containing the mummies had suffered extensive damage due the foul water. It is reported by Daily News Egypt that they have since disintegrated. The artifacts dated back to the Greco-Roman era of Egyptian history, from 332 B.C. to 395 A.D. The remains were preserved in the tradition of the time, with colorful drawings of the women on the sarcophagi tops. This type of mummy portraiture, known as ‘Fayum portraits’ often depicted the head and chest of the deceased painted onto a panel using encaustic wax or egg-tempera paint techniques. Colorful designs decorated the sarcophagi, but they had no ancient Egyptian writings or hieroglyphs. It is not clear how or why the mummies were left in the sewage water, but experts at the ministry suspect the artifacts might have been deliberately discarded there during illegal excavations. Rather than be found with priceless antiquities, any diggers, looters or smugglers might have dumped the mummies so as not to suffer the penalties of the country’s severe security restrictions. Youssef Khalifa, head of antiquities at the ministry, said “The robbers may have resorted to dumping these sarcophagi in the irrigation canal when they felt that authorities were closing in on them, or perhaps when they were approaching a security checkpoint,” reports International Business Times. Looting and illegal excavation of historical sites is a problem around the world, and political turmoil doesn’t make the situation easier for officials. According to experts, looters will strip Egypt of most of its archaeological heritage within the next 25 years unless something is done to stop it. 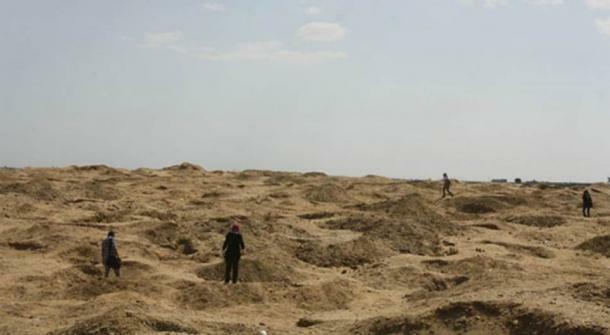 A satellite survey project, funded in part by the National Geographic Society, has examined more than 4,000 archaeological sites in Egypt using Google Earth satellite imagery, and already tens of thousands of looting pits have been identified across the landscape. Archaeologists survey damage caused by looters at Abu Sir el-Malaq, Egypt. (savingantiquities.org). The problem in Egypt has been exacerbated by bigger and bolder steps being taken by treasure hunters, who are now swapping spades and shovels for bulldozers and dynamite. Although Egypt employs about 1,200 guards at archaeological sites, most make only about $40 a week, leaving them tempted by generous bribes. Others may be scared off by armed gangs. Restoration and preservation of ancient artifacts is a time consuming and exacting practice, and the loss of the sarcophagi is a blow to conservationists and the wider community of culture and heritage preservation. The condition of the El Minya mummies is poor, but Khalifa has announced the mummies and sarcophagi will be restored as much as possible and put on display at the Hermopolis Museum.